Contemporary artists translate the romance of the West using diverse vehicles that transcend our daily lives. The great landscape artists of the 19th century who painted the grandeur of the West for the enlightenment of patrons in the East fibbed a little here and there to make images that represented the awe they experienced more than the physical facts. The secondhand awe of their patrons stirred wanderlust and, with the advent of trains and later cars and highways, they flocked West to experience the place for themselves. Today, millions of photographs document visits to the Black Hills, Grand Canyon and Big Sur, the happy tourists posed in front of the vistas that merely supply a background for "Here I am at the...."
The romance of the settlement of the West has been etched into our minds by movies and television series. The reality of mud huts and tar-paper shacks, the gathering of buffalo chips for fuel, and the hardscrabble lives of the pioneers give way to the celebration of the pioneer spirit. Despite the hardships, the pioneers did their best to keep up with the conventions of their lives farther East. Terri Kelly Moyers, Spring's Promise, oil on board, 24"x18"
Terri Kelly Moyers paints the women of the West in all their finery from cowgirls fitted out for herding cattle to young women intent on maintaining a sense of pride and style in difficult times. 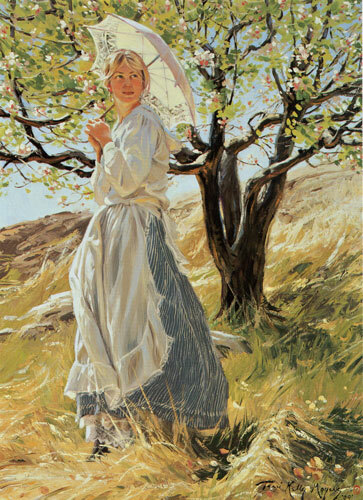 The girl in Spring's Promise protects her skin from the harsh sun with her parasol and, just as the apple tree blooms after a long winter, she looks to the future with renewed hope. Jim Vogel paints tales of the hardworking, common people of New Mexico. He has combined the mixed traditions of the region in Chicos. The homo, or wood fired adobe brick oven, is built outside and is often associated with Native American tradition. The homo, however, was introduced to Spain by the Moors and brought to North America by the conquistadors. Here, a man tends to the oven while his wife shucks corn in the background. Vogel has put the painting in an elaborate handmade tin frame. Tin work goes back to the 16th century in Spain and didn't begin to flourish in Northern New Mexico until the 1840s. 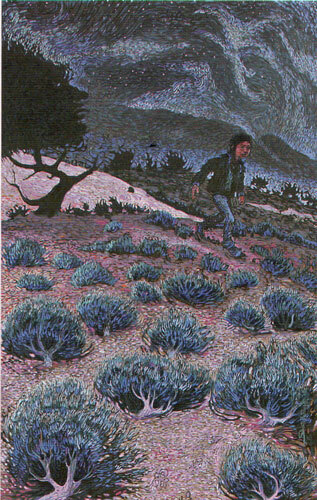 Shonto Begay, On the Path Past the Witch Tree, acrylic on canvas, 66"x42"
Shonto Begay's subject walks briskly and warily On the Path Past the Witch Tree in this haunting moonlit painting. A lightning-struck tree appears in Navajo witchcraft ceremonies. Lightning was understandably a magical phenomenon among the Navajo. In fact, one taboo was eating the nuts of a pinon struck by lightning because the nuts then belonged to the spirits. The son of a Navajo medicine man, Begay writes and paints the stories of his people. He says, "To fear and to feel the magical caress of stories that is my intent."